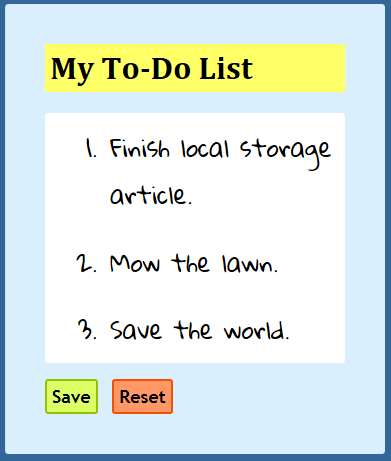 If you accidentally navigate to another page or close the tab this page was on, the default behavior when you return to this page would be to see an empty to-do list. Because web pages do not persist data by default, you have a bunch of approaches you can take for solving this problem. In this tutorial, we are going to look at one of my favorite ways of storing data by relying on what is known as the Web Storage API. This API allows you to write just a few lines of code to handle a lot of tricky storage situations, so it's going to be a fun one! The Web Storage API sounds complicated and scary, but it is mostly a pushover. It is exposed to us via two global (attached to window) objects called localStorage and sessionStorage. You can use these two objects to specify what data to store as well as what data to retrieve, update, permanently remove, and perform a whole bunch of other storage-related activities. Let's go a bit deeper in our understanding of what happens. 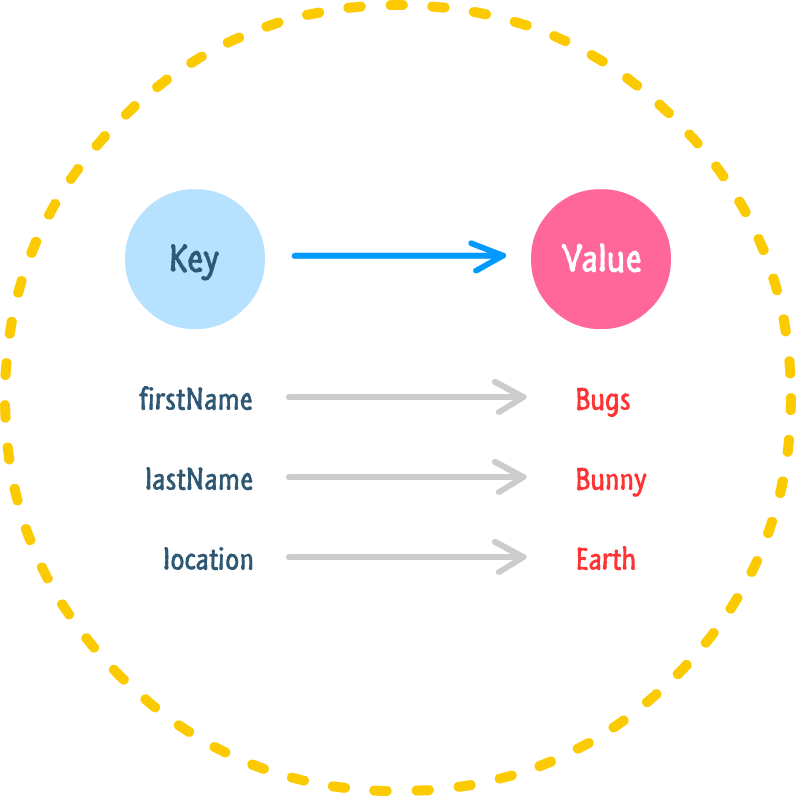 The key serves as the identifier, and the value is the data associated with it. As you will soon find out, almost all operations you perform using our storage objects will involve the key, the value, or both! We are almost done here. There is one last detail you need to know before we start looking at the code. All of the operations you perform with the Web Storage APIs are tied to whatever domain your code is being run on. This level of isolation ensures that you don't accidentally (or deliberately!) modify any data that 3rd party sites may have already set in your storage. In other words, any data I store on kirupa.com is inaccessible to code that may be running on google.com...and vice versa. If	you were hoping to use local or session storage to persist some data across multiple sites on different domains, you are out of luck! There is no UI to what we are doing here, so it's all inspecting the state of our localStorage or sessionStorage objects using your browser developer tools. Now, here is one more important detail that you should know. Your keys and values must be strings. That's right. If you want to store a snazzy custom object for retrieval later, you are completely out of luck under Web Storage. Basically, use string values and rely heavily on methods like toString() and JSON.stringify() to ensure you are storing any complex data in the form of a string that you can (hopefully) un-stringify later. The getItem method takes only the key as an argument, and it returns the value associated with that key. If the key you pass in does not exist, a value of undefined is returned instead. Pretty simple, right? A Shortcut for Adding and Removing...Maybe? This is a notation you may have seen (and possibly even used!) when working with objects and associative arrays. 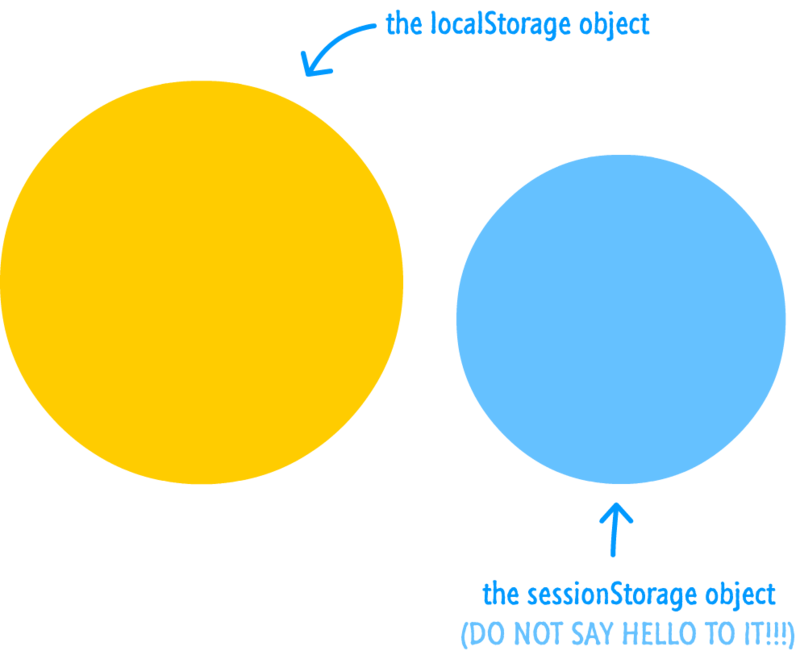 That same technique can be used with your localStorage and sessionStorage objects as well. There are two extremes to removing data from your local storage. You can remove everything scorched earth style, or you can selectively remove a key and value pair individually. This will remove all traces of any data you may have stored, so use it cautiously if you have several pages on your site that each write to the localStorage object independently and rely on data stored there actually being there. 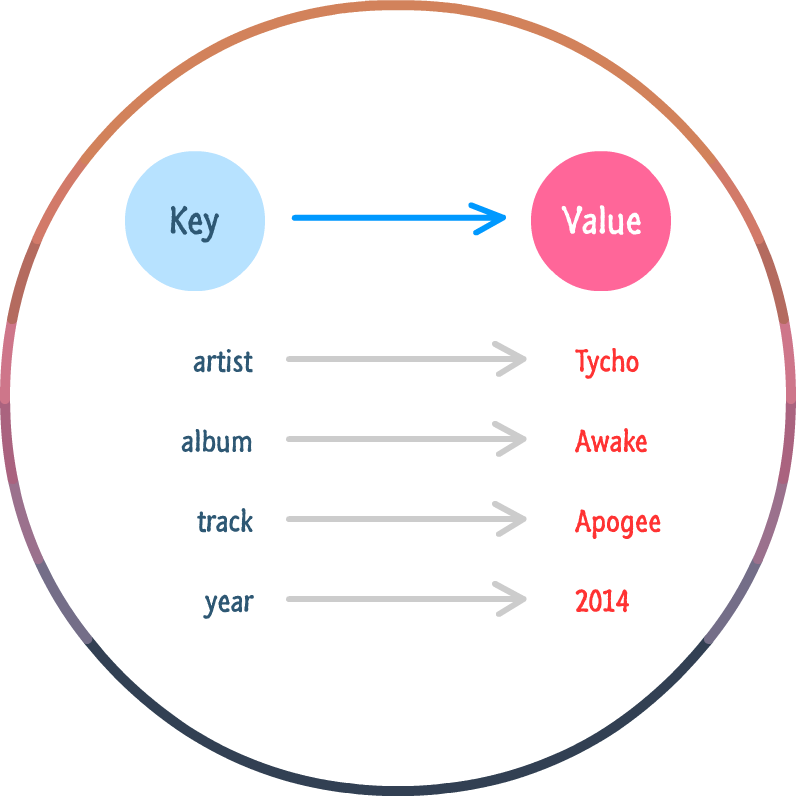 In this snippet, the year key and its value will be deleted while leaving all of the other data intact. This is the safer option if you are working on an app that has many components that rely on storing data using Web Storage. For reasons I don't know, all of the browsers give you have a fixed size of 5 MB for each domain your local storage is tied to. If you try to add more data after you have exceeded your 5 MB quota, a QUOTA_EXCEEDED_ERR exception will be thrown. This ensures that your code fails nicely while still giving you the option of notifying your users that their data can't be saved. With all of that said, you really should never have to do this. Remember, all of the data you store is in the form of strings. Five m-e-g-a-b-y-t-e-s (spelling it out for greater emphasis :P) is a lot of text-based data to store. If you need to store that much data, Web Storage may not be your best solution. Ironically, one of the last things we are going to do is talk about detecting whether someone's browser supports local storage or not. According to the caniuse statistics on it, pretty much everybody (and their mothers) is using a browser that supports it. There is another better reason outside of browser support why you want to do this. Web Storage, just like cookies, allows web sites to leave behind traces of themselves on your machine. When users are browsing using a "private" mode like the kind offered by all your major browsers, the goal is to avoid dealing with these traces of data. This means that your browser totally supports local and session storage, but it may have this feature disabled or severely crippled to respect user privacy. Trying to add some data into your local or session storage will either result in an error, or your data will simply be wiped out the moment you end your browsing session. A call to the isLocalStorageSupported function will return a value of true if local storage is usable, and if local storage isn't supported, you will see a value of false. This code snippet is based entirely on the following Gist that also outlines the brief history of local storage feature detection. As you can see, things are very similar from a code point of view! If they are so similar, why would the Web Storage API expose both of these objects for you to use? As it turns out, the major subtle difference between localStorage and sessionStorage is persistence. When you store data using local storage, your data is available across multiple browsing sessions. You can close your browser, come back later, and any data you had stored will still be accessible by your page. When you are storing data via session storage, your data is only available for that browsing session. There is no long-term persistence. You close your browser, come back a few moments later, and you'll find that all of the data stored in your sessionStorage object is gone. The takeaway is this - if you want to persist some information for just a single browsing session, you should use session storage. If you want to persist information (theoretically) forever, use local storage. For everything else, there is MasterCard. Oh, snap! Alternatively (or in addition to listening to Tycho), you can play some Scorched Earth to get some of that old-school gaming feeling going.